the powerfully modelled steed with broad muscular chest and rounded hindquarters, shown standing on a rectangular plinth turned slightly to the left, the face ﬁnely modelled in an alert expression and with ears pricked and mouth agape, covered all over in a rich honey-brown glaze, splashed in creamy white on the hooves and with a blaze of cream white on the front of the head, the ridge of the neck with a slot to receive a horsehair mane and the rump with an aperture for the horsehair tail. 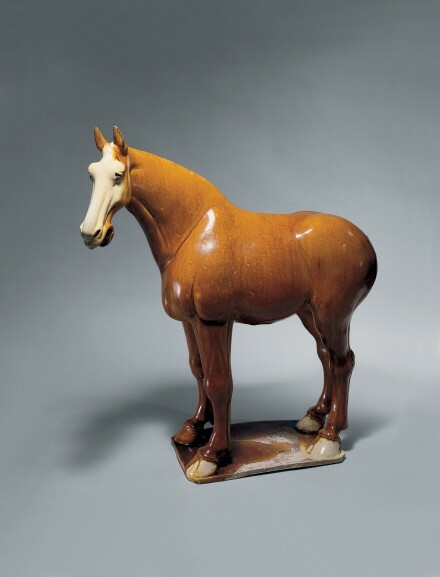 The similarly modelled amber-glazed horse, without the creamy white glaze on the hooves and on the front of the head, from the Schloss collection, was included in the China Institute exhibition and illustrated by Harrist in catalogue entitled Power and Virtue: The Horse in Chinese Art, New York, 1997, p. 73, no. 10.